A review of The Traditional Chinese Style Mosque, by Sadiq Javer. The first chapter, also the Introduction, describes the scope and purpose of the dissertation. In particular, Javer clarifies that his research focus will be on what he calls a “traditional Chinese mosque” (p. 2) and not other expressions of Muslim religious architecture such as mosques reflecting Central Asian, Persian, Arabian, or other strictly cultural or regional aesthetics. Also excluded from his study are mosques attached to Sufi shrines (gongbei) or graveyards, or prayer spaces built as part of another architectural project, such as tombs or mausoleums. The purpose of his research is to identify unique architectural features found in Chinese mosques. He investigates their history, development, and continued evolution, and also changes being made to how those features are used or understood in contemporary China. Specifically, Javer discusses “four key components: the dadian (large prayer hall), the yaodian (small prayer hall) the wangyuelou (moonsighting tower) and the minaret” (pp. 7-8, bracketed definitions added). Javer argues that these elements provide the archetypal fingerprint of a Chinese mosque. Chapter 2, “Mosque Architecture Outside China,” provides a sweeping history of the development of mosque architecture, beginning with the very first communal Muslim prayer space in the house of the Prophet Muhammad in Medina. Javer writes that the Prophet’s house was aesthetically similar to other nearby residences, but modified in size and structure to accommodate its purpose as a communal meeting place for social and religious functions. This initial function-oriented modification “would formulate the principles upon which all mosque architecture would be based” (p. 10) in every region of the world thereafter. Historical descriptions of the Prophet’s house and early mosque architecture are based on research by K. A. C. Creswell, Richard Ettinghausen, Oleg Grabbar, Robert Hillenbrand, and others. Javer’s research contributes directly to the body of scholarship these authors helped to develop, namely the study of Muslim architectural styles, functions, and histories. Javer understands the architectural elements of early mosques in terms of form following function. General orientation is predetermined by the direction of prayer, and internal spaces developed around the needs of people, leading to areas for ritual washing, congregational space, a hostel for the poor, and an elevated platform from which to deliver sermons. (p. 13) Later mosques could hardly do without incorporating these functional spaces, so their forms, despite regional stylistic variations and aesthetic additions, necessarily derive from the original model. The elements Javer identifies as typical for any mosque are the minaret, main entrance, courtyard and ablution area, qibla wall with mihrab, minbar, dome and transept. The third chapter, “History of the Mosque in China,” relates individual construction and repair histories of mosques in various regions of China. The principle sources of information for these histories are government records, site monuments such as steles, encyclopedias, informal local accounts, and tourist brochures. In Chapter 4, “The Chinese Mosque Space and Its Components,” Javer names several architectural features unique to Chinese mosques. The first of these is the wangyuelou, a tower for observing the moon to mark the dates of the Islamic lunar calendar. A zhaobi is a decorative screen across the entrance, often bearing Qur’anic inscriptions in Arabic calligraphy. Some mosques have a beiting, or small pagoda to house and protect the stele commemorating the mosque’s construction. A jiangtang, or study hall, is often found along the sides of the central courtyard, perhaps opposite the ablution area. Javer argues that the orientation of these spaces emphasizes an inward-facing focus that defines the space as sacred, while the outer walls of the mosque complex often do not display much or any ornamentation, and may even lack windows or alternate entrances beyond the main gate. Chapter 5, “Detailed Analysis of the Dadian,” describes variations in the construction of the main prayer hall in Chinese mosques, including size, delineations of forward and rear sections, and the relationship to other structures and spaces within the mosque complex. In particular, Javer notes that a dadian, or main prayer hall, may be a single large space or may be segmented into two or three sections. In front of these, there may be a yaodian, or smaller area next to the mihrab. At the entrance to the prayer hall, a porch area with benches may exist as a space for congregants to remove and store their shoes before entering the prayer area. Javer includes a number of case studies of individual mosques, providing photographs to accompany his descriptions of how elements of the dadian are consistent in essential form and function but with minor differences in size or aesthetic expression. He theorizes that the dadian of some mosques may be composed of two or three sections because it would be easier to build and may have expanded linearly in stages to accommodate the growth of the community over time. In chapter 6, “Detailed Analysis of the Yaodian,” Javer turns to the yaodian, a smaller room sometimes situated towards the front of the congregational space of the dadian. The main function of this space, according to Javer, is to provide a smaller congregational space for up to 15 people, often the imams and their main students, to pray or study. The advantage is that it can be sealed off from the larger prayer hall and heated for daily use in the winter. Javer suggests that some yaodian may have been added to the main hall later, not only as a convenient space for the imam and his cohort to use, but also as an entryway through which they might directly access the front of the mosque on Fridays after the main hall had already filled with congregants. Individual case studies and photographs of yaodian spaces in mosques from different regions of China are included. Chapter 7, “Detailed Analysis of the Wangyuelou and Xuanlita/bankelou (minaret),” introduces two auxiliary structures of a Chinese mosque, the moon-sighting tower and the minaret. Anywhere in the world, mosques often have a minaret, but the wangyuelou is unique to Chinese mosques. These towers may be separate structures or combined in a single tower and are either positioned above the main or secondary entrances to the mosque complex, within an interior courtyard, or above the mihrab of the main prayer hall. Most, but not all, of these towers are built in the style of traditional Chinese pagodas and are no longer used for giving the call to prayer or sighting the moon, yet remain symbolic monuments. In chapter 8, “Changes in the Chinese Mosque’s Space,” Javer offers comprehensive reflections on patterns of Chinese mosque spaces and the meanings expressed through the various architecturally delineated spaces. Congregants move from one space to another in a regular pattern, through symbolic and ritual areas, and this engenders a sense of leaving the mundane world and moving progressively into more sacred space. The space of a mosque complex is hierarchical, linear, and interior-facing. Javer also considers how modern urbanization has affected physical features and perceptions of mosque space, such as the loss of interior privacy as tall buildings look down into the mosque courtyards and the abandonment of traditional Chinese mosque architectural styles when reconstructing historic mosques that had been damaged or destroyed. The concluding chapter provides a concise summary of the main points of each of the previous chapters. Javer also reflects on the place of Chinese mosques as a unique form of Chinese architectural expression and recommends further research into the mosques of China’s ethnic minorities, which were not included in his dissertation. A benefit of Javer’s research is what the recurring trends in Chinese mosque architecture identified in this study reveal about the history of Muslim communities in China. The fact that Muslim communities built similar structures in diverse parts of China and in different historic periods indicates an impressive continuity, not only of architectural aesthetics but also of communal purpose. For example, the frequent inclusion of a separate yaodian indicates that Chinese Muslim communities often had small groups of dedicated in-house religious scholars or devotees who would use such a space, and that the community sponsoring the mosque construction valued those groups highly enough to build a dedicated space within the mosque for their use. The presence of a dedicated moon-sighting tower indicates that Muslims in China were particularly attentive to marking the dates of the Islamic lunar calendar. This is evidence of a strong attachment to the rituals and festivals of the Islamic calendar, such as fasting in Ramadan and performing Hajj at the proper time. This dissertation models how elements of the communal history and social or religious values of a group such as Chinese Muslims can be recorded in the physical arrangement of their religious architecture and the sacred space it defines. Tsinghua University. 2014. 249 pp. Primary Advisor: Wang Guixiang. 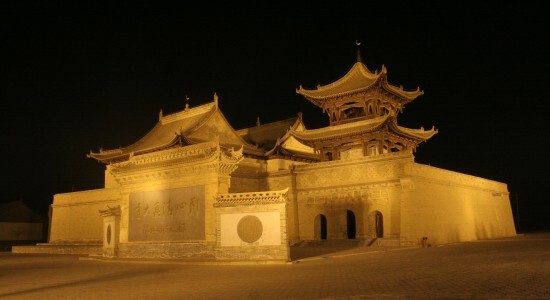 Image: Tongxin Qingzhen Dasi (Tongxin Great Mosque) at night; Tongxin, Ningxia, China. Photograph by Sadiq Javer (2012).